Welcome to the first EPPI-Reviewer 4 newsletter. The newsletter will be sent periodically and provide you with information on all things related to EPPI-Reviewer 4. We have a What's new section that will let you know about any changes we have been making. There is also a How to section where we will highlight how to use some of the more commonly used functions in the software. We have a Tips section to suggest ways we think will help you best use the software and a Fixes section that will let you know of any issues with the software we have identified and corrected. We do not wish to clutter your inbox. If you prefer not to receive the newsletter you can send an email to EPPISupport@ioe.ac.uk with the text 'Stop sending newsletter' in the subject field. You can also remove yourself from the list of recipients on the Summary page of the 'EPPI-Reviewer 4 account and review manager'. All trial accounts created after June 1 will now have a small example review copied to that account. You are free to browse and edit this example review to explore many of the program's functions. The example review contains imported items that have been coded using multiple coding tools. There are prebuilt coding reports that you can run and numeric outcome data has been entered so you can try the meta-analysis functions. If you created your account before June 1 you can still get your example review through the 'EPPI-Reviewer 4 account and review manager' (which you can find on the EPPI-Reviewer 4 gateway). Just look under 'Utilities' / 'Example reviews'. If you are carrying out multiple reviews and need to use the same codeset in more than one review, or updating an existing review and want to keep the original review intact as a permanent record, you do not want to have to recreate the tool each time. We have now added a codeset copy function to the Utilities tab in the 'EPPI-Reviewer 4 account and review manager' (which you can find on the EPPI-Reviewer 4 gateway). Just look under 'Utilities' / 'Codesets'. If you allocate items for coding, EPPI-Reviewer will keep track of which items you have and have not worked on. The way to set up coding assignments is to identify the items to assign, specify the person(s) to do the coding and specify the codeset/coding tool you want that person to use. You can create an allocation codeset to identify the items to allocate to a coder. In that codeset you can then create allocation codes. It is a good idea to give the codes easily identifiable names so you know what they represent. 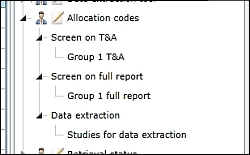 In the diagram, the code 'Group 1 T&A' represents items that will be assigned for screening based on Title and Abstract. You can then assign this allocation code to the items you wish to allocate. This will allow you to identify the items when you are creating the work assignments easily. Alternatively, you can click on the 'Assign documents to specified codes randomly' icon and have the system generate the allocation codes and randomly assign items to those codes. If you use this method, it is still a good idea to rename the allocation codes afterwards so they are easily identifiable when creating the work assignments. In the Collaborate tab click on Create new and the Assign work window will appear. In the first dropdown menu select the allocation code that identifies the items that you want assign. In the second dropdown select the code set that you want the coder to use while coding. Finally, in the third dropdown select the person you want to assign the items to and click Assign work. If you are assigning items for double coding/screening you just need to repeat this process but in each case pick a different person. Also note that if you are double coding, only the codeset listed in the second dropdown should be set for multiple data entry. You should now see the coding assignment you have just made. The system will now keep track of what items you have coded (Started column) and the items you still need to code (Remaining column). Clicking on the number in the column will display those items in the Documents tab. Screening tools - there are a number of advantages in restricting your screening tool / codeset to a single level hierarchy using exclude and include codes. This structure allows you to easily see the status of each item by running a frequency report. It also allows you to compare different reviewers' coding using a single 'Quick report' in the collaborate tab and avoids the user having to change hierarchy levels when using the 'Live comparison' function in the Document details window. We test all changes that we make to EPPI-Reviewer but sometimes things slip past us or they need optimising. We recently identified a scenario where bulk assigning a code to items using a code from a codeset set for multiple data entry, when the same code had already been assigned by the same user, but not completed, was causing multiple entries of the same code. It resulted in items being displayed multiple times in the Documents tab. The issue was identified and corrected without requiring a full software update. - Making use of reviews/models of research use. You are receiving this EPPI-Reviewer 4 newsletter through your EPPI-Reviewer 4 user account. If you no longer wish to receive this newsletter please contact us at EPPISupport@ioe.ac.uk. You can also remove yourself from the list of recipients on the Summary page of the 'EPPI-Reviewer 4 account and review manager'. EPPI-Reviewer 4 is developed and maintained by the EPPI-Centre at the Social Science Research Unit at the Institute of Education, University of London, UK. To find out more about the work of the EPPI-Centre as well as information about how to do systematic reviews, please visit our website http://eppi.ioe.ac.uk.